Cairns port expansion threatens to undermine our bay. 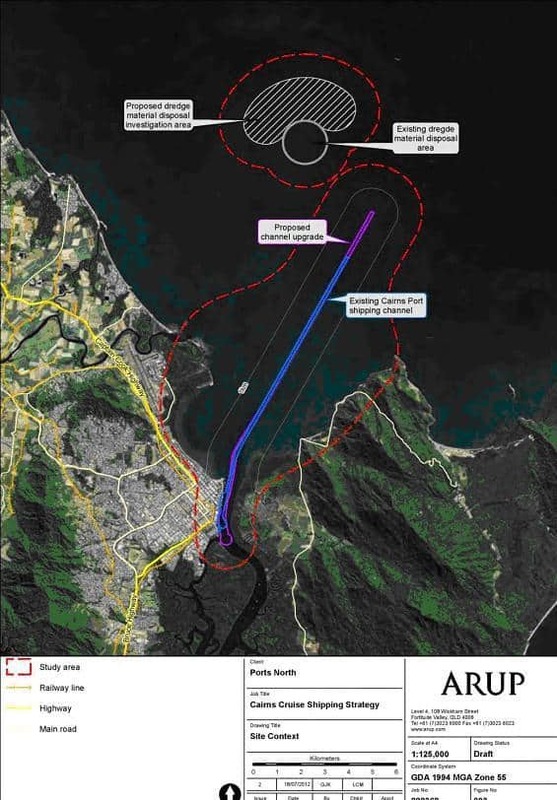 With the ‘Cairns shipping development proposal’ environmental impact statement (EIS) set for release in March or April of 2014 now is a good time to examine the threat the proposed port expansion poses to our marine environment. Diseased Barramundi after dredging in Gladstone Harbour, insets dead dugong and turtle from after Gladstone dredging. 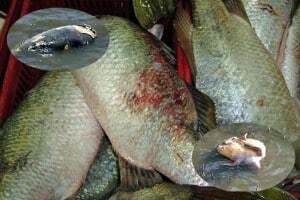 Source ABC, credits, Gladstone fish market, ABC TV, Tony Falzon. Ports North proposes to widen the existing outer channel (11.2km long) from 90m to 140m wide and increase depth of the outer and inner harbour channel from 8.3m to 9.4m.This would mean the removal and disposal of well over 5 million m3 of dredge spoil from the channel and inlet. Estimated annual maintenance dredging quantity for the proposed channel is 580,000 m3 (an increase of 260,000 m3/year from the current annual average). To give you a feel for just how much this is – Governments have spent over $200 million over 4 years on reef rescue projects to improve agricultural practices and revegetate stream banks reduce in order to reduce sediment and nutrients from running off into the Great Barrier Reef (GBR). These worthy projects have resulted in an estimated prevention of 92,000 m3 of sediment runoff. 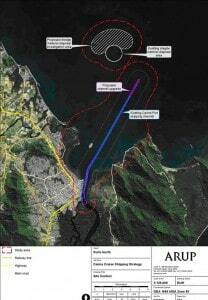 Compare this to the proposed dumping of over 5 million m3 in one year from Cairns port alone. Dredge spoil dumping increases water turbidity (muddyness) which smothers and cuts off light to corals and seagrasses. Our seagrass is in its worst state in recorded history and has not recovered from cyclone Yasi as it should have (see article in September Ecotone for details). The recently released draft strategic assessment for the GBR has identified most of the reef as being in poor health and sediment and nutrient load as a major threat to reef health. Dredge spoil dumped in our region impacts on offshore reefs and would muddy our Northern beaches. The mud to be dredged is almost certainly contaminated and resuspending this sediment into the greater Trinity environment can lead to wildlife, and perhaps even human, health impacts. We only need to look at the outcomes of dredging in Gladstone harbour which was associated with fish disease outbreaks and devastated the recreational and commercial fishing industries. Recently cover ups and misinformation regarding Gladstone’s’ world famous water quality problems have come to light and Federal Environment Minister Greg Hunt announced that the Federal Government will no longer allow offshore spoil dumping in the area. We need to prevent the same thing happening locally before the impacts, not after. This proposal must also be considered in the context of other dredging proposals along the Queensland coast. The state of reef health and these proposals (including the Cairns proposal) has lead UNESCO to consider listing the GBR as ‘world heritage in danger’ – an outcome which has the potential to devastate the tourism industry. The Governments responses in the form of the strategic assessment and the draft Queensland Ports Strategy fall short of addressing the problems. The Ports Strategy calls for prohibition on “capital dredging… outside of PPDAs* for the next ten years. However “This restriction also does not apply to … proposals which are currently the subject of an active environmental impact statement (EIS) process or proposals currently designated as a major project by the Queensland Government” – what a joke! The Draft shipping management strategy was open for public comment until 13th December and the Strategic assessment until 31st January. Read our comments on the Strategic Assessment here. Do the benefits outweigh the negatives? This proposal is being pushed on the premise of the expansion allowing larger cruise ships into the Port. Promises regarding financial benefits are not backed up with any data or indication of how they have been calculated. Just how much do cruise passengers actually spend in a brief visit onshore? Cruise operations plan for most meals, all accommodation and most entertainment to happen on the ship. Is it worth more than the tourism that brings people to Cairns to stay for many nights while they enjoy the inner and outer reef and coastal environment that is under threat? This development has a State Government election promise of $40 milllion dollars in funding. There are few estimates of the real cost that come out at under $80 million. Could this taxpayer money be better spent on other programs to support local business that protect the reef and inshore environments that are the basis of our tourism and fishing industries? We think so. The EIS terms of reference call for the examination of alternative dumping options to placing dredge spoil on our doorstep in the GBR marine park. It will be interesting to see what this examination comes up with but early indications are that other options are fraught with their own environmental problems such as exposure of acid sulphate soils, or are uneconomic. Other alternatives may include offshore loading facilities linked by an extended jetty, though these are likely to be expensive and cyclone prone options. In reality the alternative is staring us in the face. The announcement in the Cairns Post (Nov 16) of the new passenger facility upgrade at Yorkeys Knob where passengers from larger cruise ships currently come ashore may be a step in the right direction. Transferring cruise passengers onshore by tender is not uncommon e.g. the port of Saint-Tropez, and does not need to be a disincentive for tourists to visit. We don’t need new capital dredging in Trinity inlet, it will cost the taxpayer and the environment, will hurt small business and recreational fishers that rely on coastal and reef health, will muddy our beaches, potentially be the final straw for our seagrass beds and the dugongs and turtles that rely on them, could put the broader reputation of the GBR at risk by contributing to it being listed as ‘world heritage in danger’… the list goes on. All at great expense to the taxpayer and for questionable economic benefit, most of which we would get anyway by bringing passengers ashore at Yorkeys Knob and investing in better options to support local industries that don’t destroy the environment.